Te Moana-nui-ā-Kiwa, the Pacific Ocean, was one of the last areas of the earth to be explored and settled by human beings. It was only around 3200 years ago that people began heading eastwards from New Guinea and the Solomon Islands further into the Pacific. Great skill and courage was needed to sail across vast stretches of open sea. Between 1200 and 1000 BCE these voyagers spread rapidly to Fiji and West Polynesia, including Tonga and Samoa. Sometime after about 2000 years ago people began to inhabit the East Polynesian archipelagos, settling the closest first. The movement of peoples around the Pacific and from Asia into the Pacific over the last 6,000 years. New Zealand was the last significant land mass outside the Arctic and Antarctic to be settled. The Polynesian culture emerged in Fiji, Samoa and Tonga from the earlier Lapita culture, which had formed from the mixing of the Melanesian peoples already living in Near Oceania with migrants from the vicinity of Taiwan. During the first millennium CE Polynesians sailed east into French Polynesia and the Marquesas, before migrating to Hawaii (600 CE), Easter Island (700 CE, and New Zealand (1250–1300 CE), the far corners of the 'Polynesian triangle'. A broad range of evidence – including radiocarbon dating, analysis of pollen (which measures vegetation change) and volcanic ash, DNA evidence, genealogical dating and studies of animal extinction and decline – suggests that these islands’ first permanent settlements were established between 1250 and 1300. These migrants, who sailed in double-hulled canoes from East Polynesia (specifically the Society Islands, the southern Cook Islands and the Austral Islands in French Polynesia), were the ancestors of the Māori people. This double canoe was sketched off the New Zealand coast in 1769 by Herman Spöring. It has a double spritsail rig and appears to be made from two canoes of different length and design lashed together. 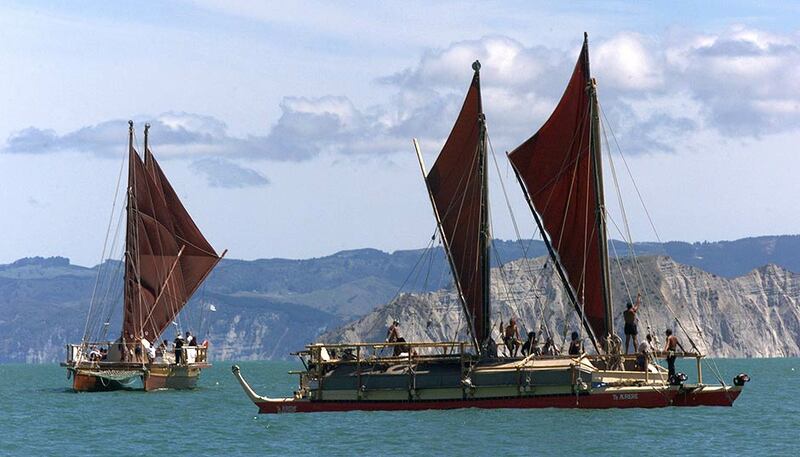 Archaeologist Atholl Anderson argues that the double spritsail was the most likely type of sailing rig used by the Polynesian voyagers who reached New Zealand in the 13th century. According to many tribal narratives, Kupe was the first Pacific explorer to discover the islands of New Zealand. Stories about his exploration on his canoe, the Matawhaorua or Matahorua, differ from region to region but often feature a fight with a great wheke (octopus). Many New Zealand place names, preserved by later generations of Māori people, recall his journey. Cliff Whiting, for the New Zealand Geographic Board, Crown Copyright reserved. Toitehuatahi (Toi), another early visitor from Hawaiki (the traditional Māori place of origin), is an important ancestor for many Māori people. One of the captains remembered as voyaging to New Zealand was Turi, the captain of the Aotea canoe. Stories of Turi and Kupe are intertwined throughout the Pacific. Tradition says that Turi followed Kupe’s instructions when sailing from Hawaiki to New Zealand via Raoul Island in the Kermadecs. The canoe made landfall in Waitematā Harbour, then travelled down the west coast of the North Island from Aotea Harbour, named after the canoe, to Pātea in Taranaki, where he and his people settled; many places on this coast are named for events that occurred during this journey. Turi, the captain of the Aotea canoe. Although it was once believed that the ancestors of Māori came to New Zealand in a single ‘great fleet’ of seven canoes, we now know that many canoes made the perilous voyage. Through stories passed down the generations, tribal groups trace their origins to the captains and crew of more than 40 legendary vessels, from the Kurahaupō at North Cape to the Uruao in the South Island. Today, Māori whakapapa to these captains and crew. For more information about each of the waka and their voyages of exploration, see Te Ara's entries on Canoe navigation and Canoe traditions. Over the centuries that followed, Māori developed a detailed knowledge of New Zealand’s coast and interior and its flora and fauna. See Te Ara for more on Māori New Zealanders and their world. Sometime between 1300 and 1550, Māori from New Zealand settled on the Chatham Islands (Rēkohu), more than 750 km south-east of the mainland. For around 400 years their descendants lived on the Chatham Islands without contact with other peoples and the unique Moriori culture developed. See Te Ara for more on Rēkohu and the Moriori. 'Pacific migrations', on Te Ara - the Encyclopedia of New Zealand. ‘Ideas of Māori Origins’, on Te Ara - the Encyclopedia of New Zealand. ‘Canoe Traditions’ on Te Ara - the Encyclopedia of New Zealand. 'Wayfinding Revival’ article, on the NZ Science Learning Hub website. Polynesian Voyaging Society – founded in Hawaii in 1973, the Polynesian Voyaging Society builds replica canoes and sails them using traditional navigation methods. The Canoe is the People: Indigenous Navigation in the Pacific – a website designed mostly for Pacific youth which honours and explores the knowledge and skills of traditional Pacific wayfinding. Kupe Voyaging by the Stars – this 1993 documentary shows Hekenukumai 'Hector' Busby, from Northland, lead the construction of a waka hourua (double-hulled canoe), then retrace Kupe's course across the Pacific, back to Rarotonga. NZ On Screen. He Korero Purakau mo nga taunahanahatanga a nga tupuna: Place names of the ancestors, a Maori oral history atlas. Wellington: New Zealand Geographic Board, 1990.